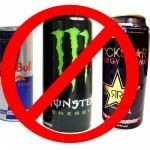 Highly caffeinated energy drinks are becoming very popular with young people. They use them to improve sports performance, to increase energy for partying, or just to stay up late. Unfortunately there is new evidence suggesting that those using these high energy drinks are putting themselves at higher risk. A recent study found consumption of energy drinks was associated with sudden death, heart attacks, ruptured arteries, heart arrhythmias, and elevated blood pressure, particularly among adolescents and young adults. The study found young consumers are at a particularly high risk of complications due to hazardous consumption patterns. So the next time you’re thinking about buying the 2 for 1 energy drink offer at your local service station or convenience store, think again, and stick with the less damaging options like a cup of coffee.